Garak's shop is destroyed in an explosion. It is quickly discovered that it was no accident. Someone tried to assassinate Garak and now it is up to Odo to find out who and why, and that means navigating the murky past of the station's resident tailor/spy. 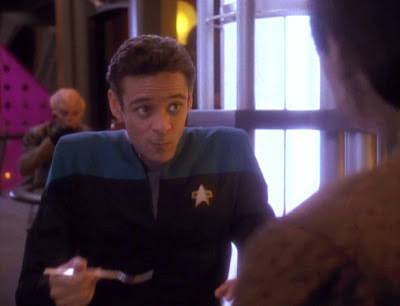 Bashir does a spit-take at Garak's latest homosexual innuendo. Kevin: This is a great episode, no two ways about it. More than anything, particularly after some of the mid-season snoozers we just got through, every frame of this episode positively crackles with energy. Garak is an inherently interesting character, probably the most interesting character on the show, other than Quark maybe, and watching him spar with Sisko, Odo, and Bashir is just fantastic. It never goes off the rails and becomes campy. It's just intersting to watching his character bounce back and forth between pushing the investigation forward and obfuscating as much truth about himself as he can. His alternate moral to The Boy Who Cried Wolf remains one of my favorite lines in the franchise. Matthew: If a Star Trek story is going to lack science fiction credentials, it had better do two other things well. First, it should advance a character's story. That's pretty obviously true, here. Garak is given lots of spotlight, and we learn about his break with Enabran Tain, his exile, and his desire to return. Second, an episode had better be entertaining on a sheer plot level. I want to be engaged by the movement from point A to points B and C. That's true here, as well. The investigation is fun, and the eventual payoff we get in the overall Dominion plot of the series feels "worth it." Secret plots for preemptive strikes, assassinations, character reveals and double-crosses, all that, it's just entertaining stuff. Unlike several recent shows, I never thought, "gee, I wish I could have that 45 minutes back." Kevin: I liked the investigation plot we got. It built well. Odo's conversation with the Flaxian and his perfumes was great, and full of awesome "I know, you know I know, I know you know I know" double talk. Playing with the audience's expectations about where the episode is going by destroying the Flaxian's ship was great. Odo's conversation with his informant is awesome. I like that Sisko gives Odo the latitude to not reveal a source that he only has access to because of his particular past. It makes Sisko's constant defending of an otherwise crotchety man who actively derides the rules make much more sense. Up to Odo confronting Garak in the Security Office, everything just moved with such momentum and energy, it's hard not be enthralled. Matthew: Putting characters in a "buddy show" can backfire, but it can really advance them, too. Even though this is a Garak spotlight, Odo is made to feel much more real to the viewer, too, just by his interactions with him. Garak is so wily that another character really has to bring their A game to keep up. The writers did a great job making Odo feel confident and interesting, and their interplay had a nice comic undertone. Kevin: The scene between Odo, Garak, and Tain is great too. I like that it builds history without getting bogged down in exposition. They are talking about their history the way to people with history actually talk about it. My conversations with Matt, "You know that blog we run together? -- You mean the Star Trek-related blog? Indeed, it's called Treknobabble." It's nice to see writers know how to organically seed information in a conversation is all. Also, I loved that they called back to the ships in the Orias system from "The Defiant." It's the first real hints of the arc storytelling the show will engage in. Matthew: I think it was exquisitely written for the Garak character, which allowed Robinson to act it exquisitely as well. Giving him the opportunity to go from anger to hopeful reunion was a great moment for the character. Kevin: A few nitpicks. Putting "Paul Dooley as Enabran Tain" in the opening creditis was a mistake. It telegraphs the reveal waaaay too early. The explosive device and perfume trick indicating the species of the perpetrator is an old trick and just annoying. I get it's a shortcut that saves valuable exposition time, but really, if a bomb type were that connected to the Romulans, wouldn't non-Romulans use it to implicate them? Kevin: It does get tiresome constantly complimenting Andrew Robinson, doesn't it? It's his own fault for being so consistently awesome. Every scene he is in is great and there's not much more to add. Auberjonois did a great job too. Whatever your feelings about him portraying his feelings, I think we all agree, hardened gumshoe is right in his wheelhouse. His scene with his informant was perfection. He managed to load the responsive "No" to the Cardassian neck trick question with tons of unspoken backstory. Matthew: This was Robinson's best turn in the role so far, and it's because he was finally allowed to break his emotional control, and show us his true feelings. The fact that it was subtle and brief made it all the better. He was given the material and hit a home run with it. This is in Auberjonois' top two or three shows, too. He has great chemistry with Robinson and held up his part quite well. Kevin: Paul Dooley is just so good at being a terrifyingly creepy nice old man, isn't he? He's only on screen for five minutes, but every word and gesture is fantastic. Joseph Ruskin was Galt in TOS' Gamesters of Triskelion and Tumek in House of Quark, and he just has the best voice. It's compelling. Carlos LaCamara was great as Retaya, the Flaxian assassin. He had a lot of energy and a slickness that played well in his scene with Odo. Matthew: Yeah, in re-watching, it's pretty amazing how little there is of characters besides Garak and Odo. The rest of the cast is relegated to bit parts, but it doesn't feel off. In addition to those you mention, I liked Julianna McCarthy as Mila and Darwyn Carson as the Romulan operative. This was a well acted show all around. Kevin: The explosion and aftermath was well done. I really liked the Flaxian's makeup and his ship, which I am almost certain was not a reuse of any kind. The explosion was well done too. Again, I love all of Garak's outfits to point of kind of wanting to own some of them. The shot of the Romulan ship I believe is a reuse from Mind's Eye, but I did really like the Okudagram of it decloaking. I was very proud of myself for catching the ship outline on the panel before they showed it outside. Matthew: Any time they can show alternative styles of building and decor, it's a good thing. DS9 can be a very drab and monotone show sometimes. So I welcome any re-use of Romulan sets, or the creation of new ones. I agree on the pryotechnics in Garak's shop. They could have cheaped out on it, but they didn't. Bravo. Kevin: This is a four. Yes, it lacks a sci-fi element, and a few bits of the investigation are too neat, but gosh darn, I don't care. This episode grabs you and it doesn't let go. I remember really thinking the first time I saw it that DS9 had finally found a unique storytelling style and that they had found their actors strengths and how to play to them in their writing. Matthew: My 4, for a total of 8, may be a bit of a knee jerk after watching so much dross. But it feels good to be back to entertaining, crisp Star Trek. It really is Garak that makes this show, as it has been with previous DS9 highlights, that they are character spotlights. It remains to be seen whether the overall plot will start pulling its own weight, too (spoiler: yep). I do love that Garak just happened to have a pheremonic sensor, *just in case* he should ever need to frame a Flaxian. Also the "I don't have a sense of smell" is a great way to provide descriptions for an audience who can't smell what's in his hand. As an aside, I was watching an episode of Science Fiction Theater from the fifties, conveniently on Youtube now, and someone left the following comment: "will there ever be another series like these old ones with the same amount of wonder for the possibilities for the future and what path it may take? or for what we will someday be able to achieve? all the science fiction nowadays seems to be﻿ better termed "futuristic action fiction"." Someone needs to show this to the current filmmakers. I think it would help immensely for them to just keep that statement in their heads, and the movies would improve. My criticism is not that Star Trek must focus on Starfleet. I'm criticizing the sci-fi credentials of the plot. There is no real speculative fiction at work. For instance, "Life Support" focuses on a Bajoran with a brain injury, and its effects on Bajoran politics, and his Bajoran lover. I've no problems with that. The sci-fi idea is strong (replacing brains with machines), so I don't really care about whom it focuses on. This is just a political plot. Entertaining? Sure. But I want sci-fi with my Trek to give it the premium marks. An episode will have to tell one hell of a non-sci-fi story to get a 5 from me, like it will have to make me reconsider the human condition or illuminate some deep truth or something. It's one of a plethora of reasons why the new movies are so bad. Of course, they're incompetent action movies, too. And insultingly awful misapprehensions of what "fan service" means. I totally agree with you about wonder. Wonder is exactly why I gave "Where No One Has Gone Before" and "Time Squared," episodes with definite pacing flaws, the ratings I did. They made me tingle with wonder. The best episodes will do that along with telling a crackerjack story ("Remember Me" and "Cause and Effect" spring to mind). I agree that there are no hard sci-fi elements, and little is illuminated about the human condition (with the possible exception of the starvation amid plenty line, but that's just a throwaway line). But I've always been much more forgiving about that, so we can agree to disagree.